Milford Hill was a roughly triangular field once in the Medieval Middle Field of Kingston Manor and, as you might imagine, was located on the top of the hill in today's Milford Road, on the south side of the road where the old Milford Inn stands and continuing slightly west. 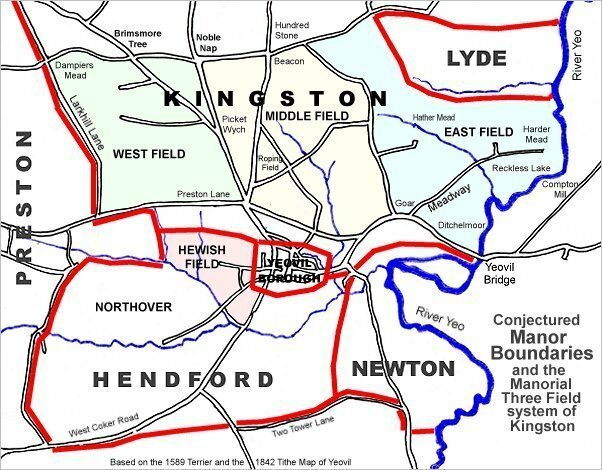 It was bounded on the west by a field called Bare Hills and on the east by the fields Langs Bush and Long Close. Indeed the field took its name from the hill it surmounted. The origin of the name Milford is something of a mystery; today's Milford Road was originally simply a field access track (it was still partly a track even into the 1940s) and certainly Milford Brook cut across it at the lowest point of Milford 'Dip' and there would be no need for a bridge for cattle. This, of course, would account for the 'ford' part of Milford, but it is almost certain there was no mill along its length. The 'mil' is most likely to have been a corruption of 'middle' in the local patois - still heard even today. Having said that, the name Milkeford was recorded in the 1590 Terrier. E Watts' map of 1806 shows a footpath "To Milford Hill and Lyde" and Grundy noted that Milford Hill was ".... 3 furlongs north-west from St Michael's church". 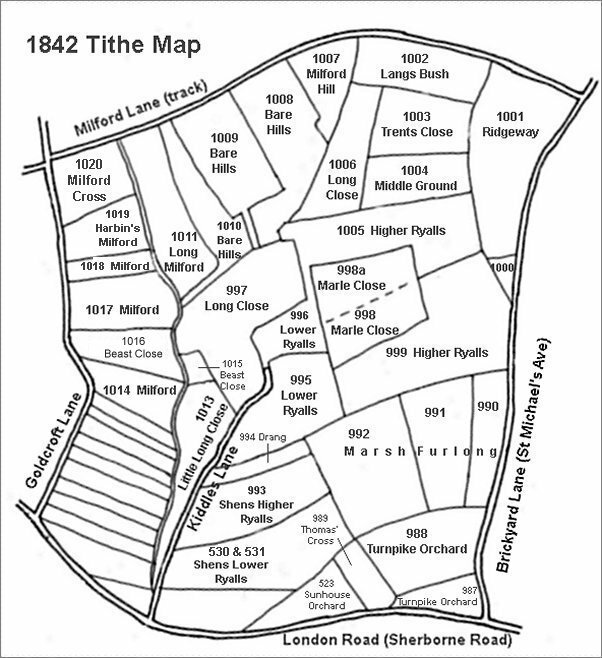 The 1842 Tithe Map and the 1846 Tithe Apportionment allocated Parcel 1007 to Milford Hill and described it as pasture. It was finally built on in the 1930s when Chelston Avenue was constructed and the width of the field ran from the Milford Inn to the western corner of Chelston Avenue. The 1946 aerial photograph clearly shows Langs Bush as a rectangular field at top right, to the south of Milford Road (running across the photograph). 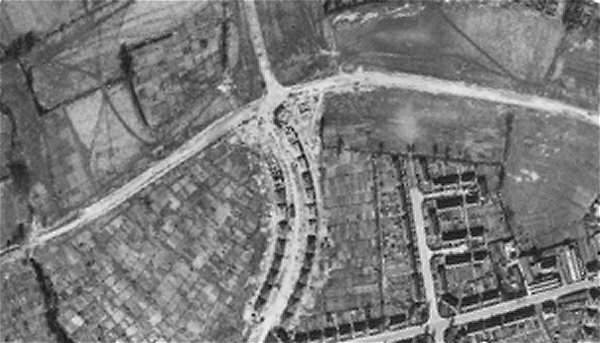 At centre is newly-built Chelston Avenue. 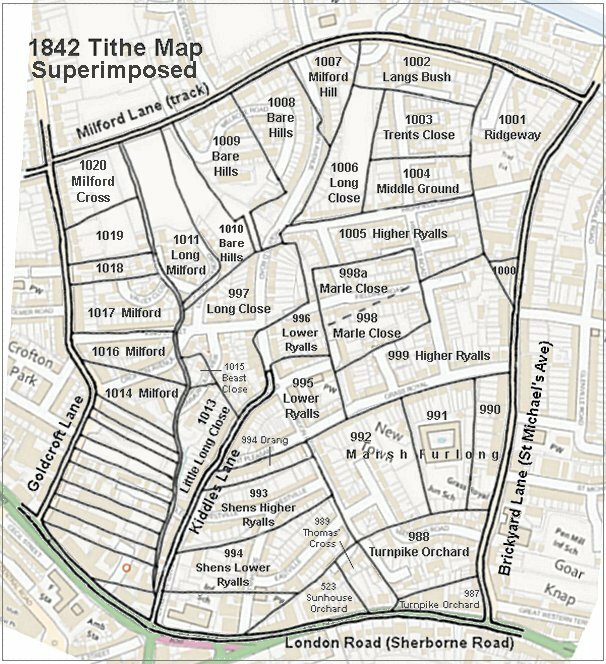 Milford Hill was bounded on the east by Langs Bush but was completely obliterated when Chelston Avenue was built.